It’s a really good feeling when you cook and eat a dish that has been around you since you were a child. Curative chicken soup has always been a part of my life, and this take on the recipe will always stay with you. It can seem like quite a long process, so you could make the stock the day before and the main soup the next day. To make things a little more interesting, but equally as nourishing, a couple of changes in ingredients creates a more exotic Asian version. Its quite dramatic how this classic dish can become a different experience using the same cooking process. Ingredients for version 2: Asian Soup. Ask the butcher to prepare your chicken, separating the legs, wings and breast, keeping the carcass. Remove the skin from the legs (use a tea towel or kitchen roll to grip the skin and pull). Take a large saucepan and put all of the stock ingredients in (except the breast, keep those in the fridge). Cover with water, put a lid on the pan and boil for 25 minutes. Remove the legs and continue to cook for a further 2 hours. Keep the water topped up and the contents covered the duration of its cooking time. Strain the stock into a bowl and put aside. Peel and slice the potato into 3cm rings. Cook the potatoes in the stock, be careful not to move them too much otherwise they will break and make the stock cloudy. Once the potatoes are cooked turn off your stock. Meanwhile, oil the pan, when it’s piping hot lay the chicken breasts, skin side down, and season with salt and pepper. Cook for about 4 mins each side on a medium heat. Cut the chicken breast into thick slices. If you feel the breasts are not quite cooked, then sit them in the hot stock for a minute or so to finish off. At this stage you want to remove the meat from the leg of the chicken and put aside. Cook off the green vegetables in boiling water (put the vegetables in as their individual cooking time demands ie. green beans would go in before peas and peas before broccoli) set the cooked vegetables to one side when cooked. Slice the spring onions, zest the lemon and finely chop the parsley, and add to the stock to slightly soften. Hold a little of each back for the final garnish. 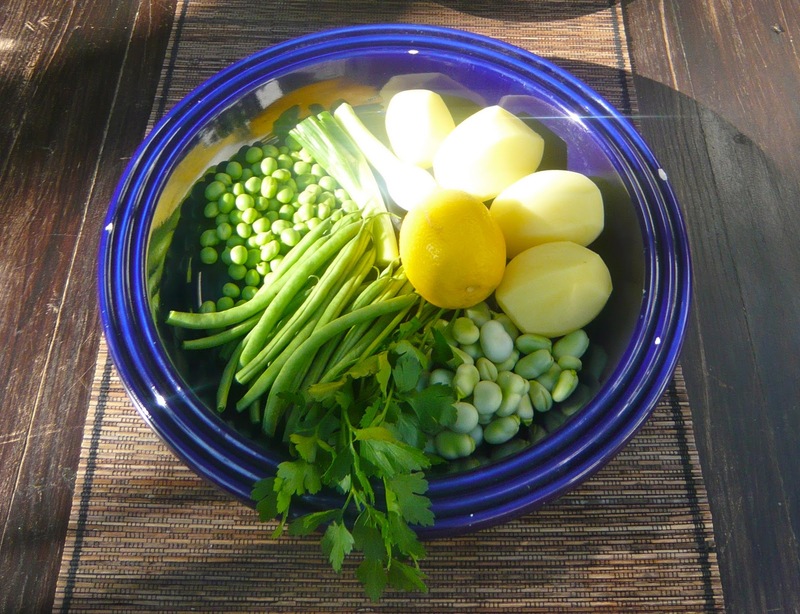 To present the soup, take four bowls and place the potatoes on the bottom of the bowl and the green vegetables on top. 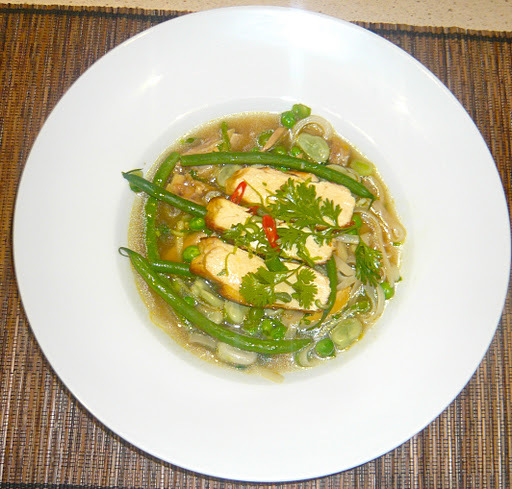 Place the sliced chicken breasts and legs onto the vegetables and ladle the hot stock over. Garnish each plate with the chopped parsley, lemon zest and the thinly sliced spring onion. Cook off the noodles for 3 minutes until firm but not cooked, swiftly wash under cold water to prevent them sticking together. 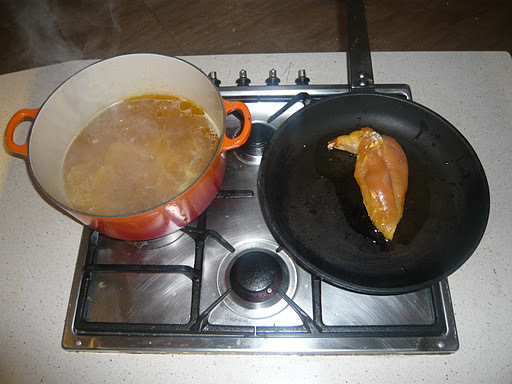 Oil the frying pan, when it’s piping hot lay the chicken breasts, skin side down, and season with salt and pepper. Cook for about 4 mins each side on a medium heat. Cut the chicken breast into thick pieces. If you feel the breasts are not quite cooked, then sit them in the hot stock for a minute or so to finish off. At this stage you want to remove the meat from the leg of the chicken and put aside. Cut the ginger into thin matchstick pieces, thinly slice the chillies and the spring onions on a slight angle. Pick the leaves from coriander, rather than chopping as this gives the dish a more Asian feel. Heat through the stock and add the matchsticks of ginger, half of the spring onions, chili and coriander and squeeze in one of the zested limes. Taste the stock to make sure it is seasoned properly add some salt if needed and more lime to taste. Add the noodles to heat them through. 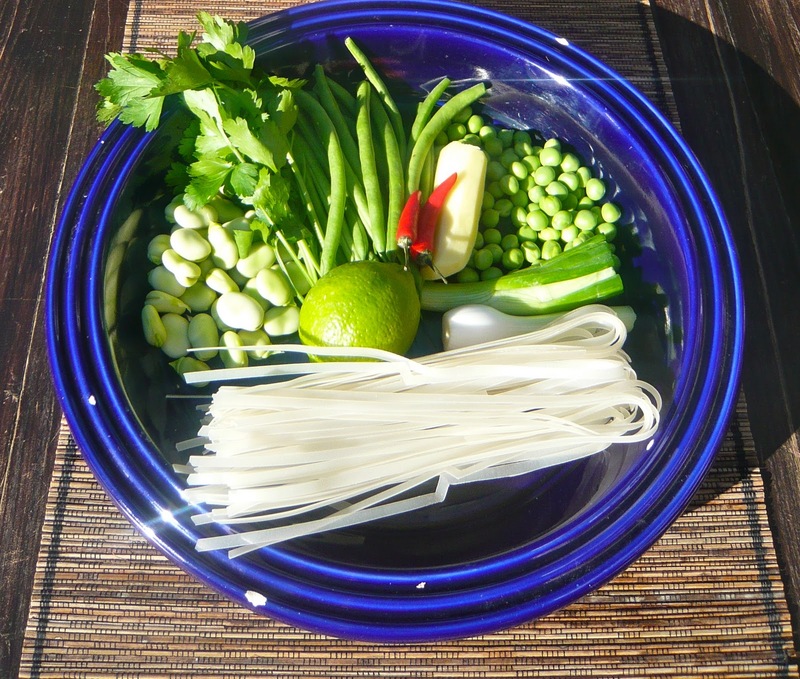 To assemble the dish take four bowls and divide the noodles evenly (tongs work best for this), place the green vegetables on top. 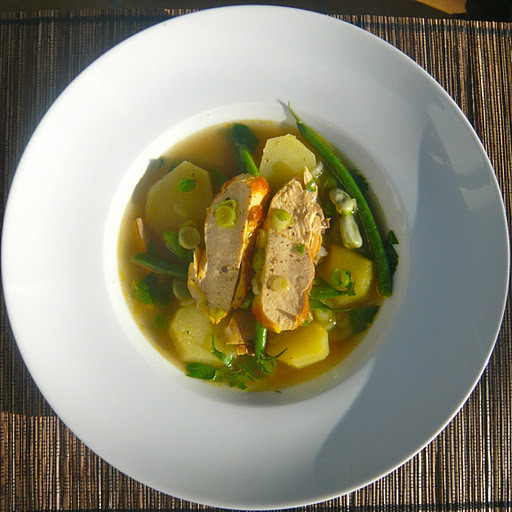 Lay flat the sliced chicken onto the vegetables and ladle the hot stock over. Garnish each plate with the chopped chili, lime zest, the thinly sliced spring onion and a good pinch of coriander.